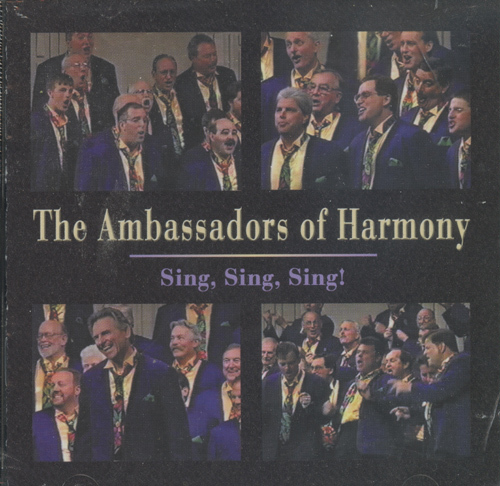 The Ambassadors of Harmony is Barbershop in grand form. Boasting premier talent, great versatility, and proven diligence, they shine as brightly as their medals won from numerous International Chorus competitions. This particular effort titled "Sing Sing Sing", the Louis Prima title track, is seasoned with Traditionals of the Jazz, Americana, English and Folk kind. Upon hearing, it is very easy to detect how much fun these guys are having. Sometimes certain music is best seen live, and it is roaringly apparent that this group is an incredible sight to see. These men sing with so much expression, you might feel you are right there in the audience. "That Old Black Magic," made famous by the Suntones, "The Heather on the Hill" by Loerner and Lowe, "Hard Times Come Again No More", by Stephen Foster are songs included in this new release. Directed by David Wright and Gas House Gang's Jim Henry.